Google changed the local search landscape again today. They do this every year or two, it seems. Today’s move is a dramatically new display for local search queries. And what makes it somewhat difficult to grasp is that the display seems to change depending on things like the query, location, and so forth. I’m not seeing the new display yet unless I use this link to get started. Greg Sterling has an excellent recap on Search Engine Land. And here, at first glance, are my quick thoughts on what this means for local search. 1) AdWords becomes more important. Do I need to mention that these ads will be made even more prominent due to their display location in Google Instant Search? 2) AdWords gets more competitive. 3) Reviews and citations become more important/visible. In the new display, not only is Google showing how many reviews it has in its system, but it’s also featuring a variety of third-party sites (like Yelp, Insider Pages, etc.) and calling out exactly how many reviews are on those sites. As I’ve said before, never has the opinion of the individual been as powerful as it is today. 4) Building out your Google Place Page becomes more important. While paid ads will replace the 7-pack for a number of local search queries (see #2 above), in cases where paid ads don’t appear or when the searcher scrolls down to see local listings … wow, the new display is like having a mini-version of your Place Page right there for the world to see. No extra click needed. Look at all the information showing for this result from a search for “chicago museums.” You’ve got the regular title and snippet listing, then from the Place Page you get a photo, address and phone information, a review snippet, links to additional reviews on third-party sites, star ratings on the right, an overall review count, and a link to the Place Page. Moral of the story: build out those Place Pages, and fast. 5) SEO becomes more important. In Greg’s article, Google specifically says that there are no longer two separate algorithms — one for the local 7-pack and one for traditional search. It sounds, then, like traditional SEO factors will more heavily influence who shows up for local search queries … and Google will then apply the local data to create the search results. Next year’s version of the Local Search Ranking Factors should be really interesting. And the next edition of GetListed.org Local University becomes even more of a must-attend than ever. In addition to Greg’s article on SEL (linked above), Google has posted the official announcement. Mike Blumenthal: What are the implications of the new integrated Local Search results? I’ll add more to the above as I find them (or, more likely, as you tell me about them). Your turn: What do you think will be the impacts of Google’s new local display? Comments are open. My very first thought, as a user, was that the results were difficult to scan. On #2 (AdWords) We’ve not used it for our business, no plans to do so in 2011. On #3 (Reviews) There’s a filter but have not figured it out yet. Seeing cases where 50+ reviews don’t show for one business, but do show for another in same category. on #5 (SEO) More important than ever. I stumbled across this today and thought it was very unfamiliar. I wasn’t even aware at first that the ads were ads and the local/places were local. How does the sponsered local/places ad work with this? I think Google is just trying to make more of their review system to return better results. I do like the #5. I believe the Organic Results maybe are gone down down, but SEO still more than alive now! Local Search has been on the SEO field for a while, but now it seems to be really true! Matt, This is a very impressive summary given these changes were just released today. Thank you for your insight. I plan to review this information and make appropriate adjustments for my clients. So much for a level playing field on Google. Is Yelp the only game in reviews? Is CitySearch the only game in local? Well, they soon will be. If your VC firm isn’t friends with Google’s VC firm, or you exist on the net as a small private competitor to the companies backed by those VC firms, you’re out of business. It also seems your title of your website is much more important as it is used as the title of your places listing in these results. The other thing is that it links to your website, not the places page It will be interesting to see if the stats will reflect a places click in the places dashboard or if Google will count it as an organic click and only report it in webmaster tools. Might be time to change your URL in your places listing to try and get an subtle identifier in there. From what I can tell it would appear that where I’ve had a clients site on the front page for a primary geotargeted keyword, say at position 3 for example, that position doesn’t seem to have changed too much, infact in many cases its moved up quite significantly, only in addition the listing has now turned into a Google Places style result. Which personally for all the clients I work with is great news. It’s especially interesting because when I do the exact same search on the actual Google maps/places page, despite the listing having several reviews and being well cited its still lingering a few pages into the results. Maybe they’ve also altered/improved the actual google maps/places algo too but have yet to update the data on those listing pages..? Either way, interesting times ahead! In recent months, whilst I’ve certainly had no problem achieving top organic results for customers, it’s often been more of a challenge obtaining a position in the seven pack, there seemed to be so many irrellevant map listings appearing from way outside the local area I’d specified in the search, including many that didn’t even have a website. So, maybe good old organic SEO would now appear to be playing a more significant part in the visibility of Google places listings – if after more testing this appears to be true, then organic SEO has just become more important that ever. I’m pretty excited by the new SERPs. It’s going to help those businesses who have invested some effort in their place pages, but I think the biggest loser might be Adwords ads. Out of the various layouts google is currently showing, is there one being shown more than others, or are they all pretty even so far? and (sorry hit the dang sub button early, eh) here’s a link that shows you WHO IS BOSS in my own town, SEO wise, eh! nice to see I’m doing okay, eh! Completely agree with the #5. 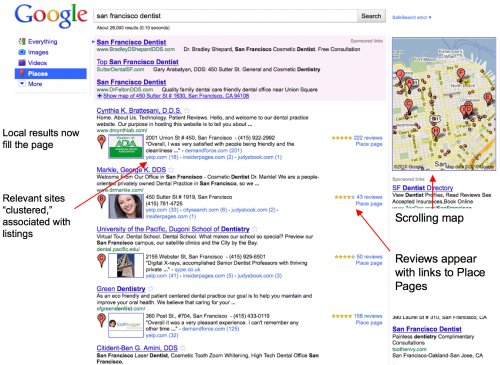 SEO and local search results are more intertwined than before. Businesses are going to have to start to perform some type of on-page optimization so that it matches their local listings. Here’s an example of a client who increased in placement due to her strong Places rankings for her home city, but totally disappeared from surrounding cities, for which she had Page 1 positions prior to the algorithm change. Has Google Gone Too Local? The problem with location is that when you have a large city like Houston, TX – and you have a carpet cleaning business 15 miles northwest of the center of the city – showing up in the 7-pack even with everything done perfect will not show up.